Custom Leather Golf Gloves Personalized in Bulk. Promotional, Very Inexpensive. Bargain Prices for USA and Canada. No Setup Charge! Low cost bulk personalized leather and microfiber golf gloves of the highest quality. Our golf gloves are custom imprinted with your logo or message in up to 5 colors at no additional cost. This long-wearing, comfortable micro fiber glove uses soft leather in the palm and thumb to deliver durable performance. It has High-Tech advanced Titanium-enfused micro fiber. The anti-microbial performance mesh dissipates heat and moistureFree artwork design. American clients pay no taxes. 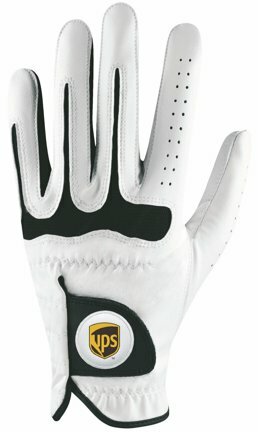 Budget Prices in USA and Canada for professional quality golf gloves with custom imprint. Prices include your 1-5 color custom imprint. Advanced Microfiber Technology with Stay Soft leather palm patch and thumb. DuPont Lycra placed in the gussets and key stress areas for unparalleled comfort and moisture management. Titanium enhanced 100% microfiber for great feel, fit and durability. New Flex Vent technology for cool fit and performance. Cold water washable and very durable. 1-5 color pad printed imprint on Velcro tab. Men's Right: S, M, ML, L, XL. PRODUCTION: 10-12 days after proof approval.